Highest Grade Omega 3’s is pharmaceutical grade Omega-3 fish oil that has been ultra-purified with molecular distillation to contain higher concentrations of DHA and EPA per soft gel. They are the two most important Omega 3’s for human health. In fact, our new and improved formula contains several times more DHA and EPA. This Omega e fish oil supplement is free from harmful levels of contaminants, dioxins, heavy metals (mercury, lead) and PCBs. The distillation process and natural lemon flavor ensure no aftertaste or fishy repeats and improved Omega 3 absorption. This dietary supplement can help improve triglyceride levels, brain function, heart health, inflammation, increase good cholesterol (HDL) levels and has many additional wide ranging benefits. DHA and EPA are polyunsaturated Omega 3 fatty acids which help our bodies in a myriad of ways. The Omega 3 story began when research was done on Greenland Eskimos during the 70s. They found that these Eskimos had a much lower death rate from heart attacks than those in Western populations. The researchers concluded that the Eskimos were benefiting from a diet high in fish, which contains Omega 3 fatty acids. Specifically, EPA (Eicosapentaenoic Acid) and DHA (Docasahexaenoic Acid) are the fish oil components which are responsible for these benefits. 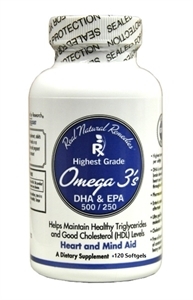 Highest Grade Omega 3’s has been specifically formulated to contain DHA and EPA in high concentration. Other brands claim to contain 1000 milligrams of fish oil (not DHA and EPA) and upon further review of the label they contain insignificant amounts of DHA and EPA. Omega 3 health benefits begin with the human cell function. Each cell has a cell membrane and in order for cells to function properly the cell membrane must be elastic and maintain fluidity so nutrients can pass through rapidly and easily. This enables each cell to produce optimum energy and function properly. Omega 3 fatty acid DHA works to improve the cell membrane and maintain healthy a cell wall, effectively improving cell function. For this reason Omega 3’s have such a wide range of benefits. Choose Highest Grade Omega 3’s to benefit more from your fish oil supplement.